© Helen Baines. Taken at San Bernard National Wildlife Refuge on March 20, 2005. Preferred Habitat: Woodlands and orchards. Seasonal Occurrence: Most common April through October. Occasional other times of the year. Breeds in our area. Profile by Daniel Elting: The Great Crested Flycatcher is a large perching bird in the large and diverse family of tyrant flycatchers. This bird is distinguished by its bright yellow belly and under-tail coverts (bottom of tail), dull white throat and namesake head crest. 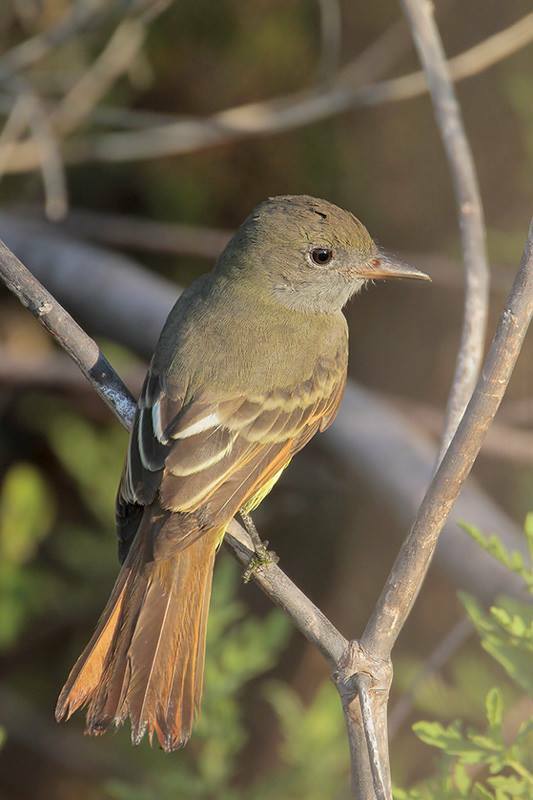 Although not extremely inconspicuous the Great Crested Flycatcher is often heard before seen. 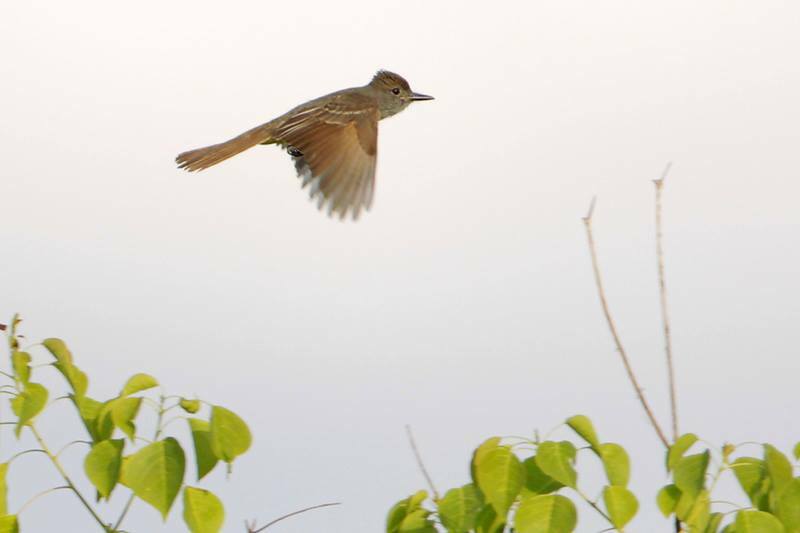 Tyrant flycatchers are known for their simple and consistent calls; Great Crested Flycatchers most frequently make a simple “Wee-eep” call that is short and rises in pitch before ending abruptly. Males will sing a slightly more complex but similar song at dawn in the heat of the breeding season, they will sing extremely frequently and intensely during this time. Great Crested Flycatchers prefer deciduous broadleaf or mixed woodland habitats with a lot of snags (dead trees). Snags are very important to breeding grounds of this species because the cavities in these snags is where the Great Crested Flycatchers place their nests. Their nests are often found in urban or semi-urban areas where snags are common. Great Crested Flycatchers prefer to eat insects and other small invertebrates, but unlike other flycatchers they will occasionally incorporate berries and other fruit into their diet. 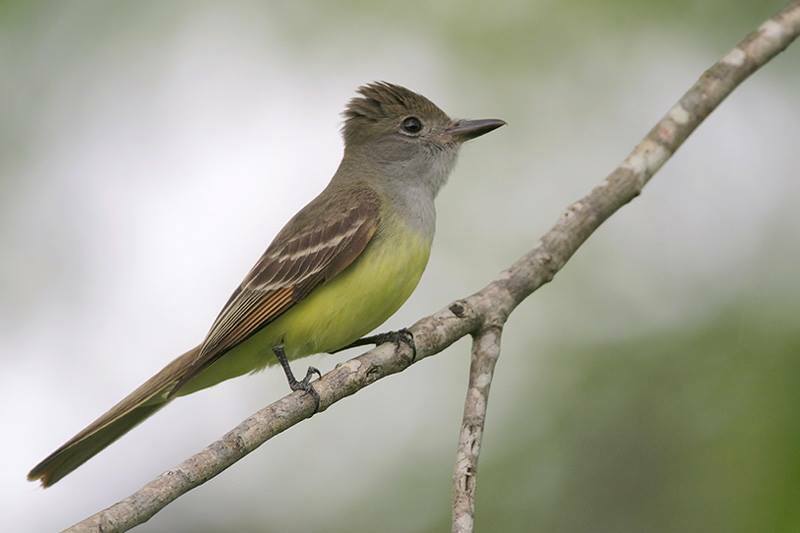 Great Crested Flycatchers are common breeders throughout the eastern United States but avoid the dense coniferous forests of northern North America. They typically leave their breeding grounds to head for their wintering grounds in Mexico and Central America. 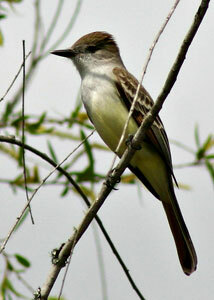 Great Crested Flycatchers are seen commonly throughout the Houston area in the summer time. Our Edith L. Moore Nature Sanctuary is a great place to find one of these birds!